Stetson University leaders and athletes gathered on April 28 for a ceremonial groundbreaking of the much-anticipated Sandra Stetson Aquatic Center. 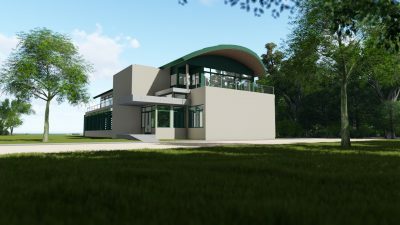 Named for a great-granddaughter of the university’s namesake, John B. Stetson, the 10,000-square-foot facility will provide a permanent home for Stetson University Rowing teams, a space for water research and a place for public recreation when it is completed next year. A rendering shows the new Sandra Stetson Aquatic Center along Lake Beresford. Sandra Stetson donated $6 million for this project, including $1.5 million which has been placed into an endowment to maintain and operate the building. In addition, Volusia County awarded a $400,000 grant from the ECHO program (for environmental, cultural, historical and outdoor recreation projects) to build public restrooms and public parking on the 10-acre lakefront site, and provide a public launch for canoes and kayaks. At the University’s 10-acre lakefront site along Lake Beresford, Stetson University President Wendy B. Libby, Ph.D., expressed gratitude to Sandra Stetson for her generosity, which is making this cutting-edge facility a reality for future Stetson students and the community. Just as Lake Beresford is the perfect place for rowing, it is also the best place to research and develop innovative technical, social and political solutions to protect freshwater resources and related environmental concerns. The Aquatic Center will enhance Stetson research at the Institute for Water and Environmental Resilience. 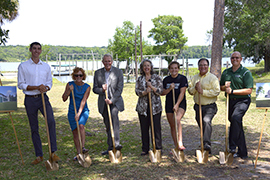 Stetson University leaders and athletes attend a ceremonial groundbreaking of the Sandra Stetson Aquatic Center. Pictured left to right are: Xavier Mulligan, member of the Stetson University Rowing team; Karen Ryan, Ph. D., Dean of the College of Arts and Sciences; Preston T. Phillips, the architect who designed the center; Stetson University President Wendy B. Libby, Ph.D.; Sarah Burnham, member of the Stetson University Rowing team; Athletics Director Jeff Altier; and Assistant Coach Stephen Harris. Stetson leased the site for a decade before purchasing it four years ago for its rowing teams. Currently, the teams keep their crew boats in a greenhouse building on the site. The new aquatic center will provide storage for 60 boats on the first floor, as well as rowing machines for the team’s daily workouts. The center will be used for rowing competitions and as a winter training site for high school and college rowing teams from the north. Stetson University has hosted the fall Rendezvous regatta, the largest racing regatta in Florida with more than 1,100 participants and 3,000 spectators, for the past four years. The aquatic center was designed by Preston T. Phillips of Bridgehampton, New York, who was recommended to Stetson University by Sandra Stetson to design and provide the architectural and engineering for the project. The second floor of the facility will have glass walls on three sides with a balcony that will wrap around three sides of the building. The second-floor ceiling will be vaulted. From the exterior, the roof is designed to resemble a boat. Outside the facility, trails and elevated walkways will lead to the water’s edge. Along Lake Beresford, there will be docks to launch crew boats and a viewing platform that will overlook the lake.